The American College of Greece (ACG) is honored that GlaxoSmithKline (GSK) is supporting two PIERCE students to attend the Global Young Leaders Conference (GYLC) in the US this summer. GYLC is part of ACG’s and PIERCE’s Academic Advancement Programs and is a unique leadership development program that brings together outstanding young people from around the world to build critical leadership skills in a global context. “It is critical for us, in Greece, to invest in talented youth and ensure that they receive the development required to ultimately assume leadership roles in our country,” says Jenny Tsimiklis, GSK HR Director at GlaxoSmithKline Greece. GYLC offers students the opportunity to learn from and exchange ideas with some of the world's top business leaders, policy officials, lobbyists, journalists, diplomats and academics in challenging and dynamic global environments. GSK has also opened up their Future Leaders Program to recent DEREE alumni, and has received 70 applications from around Greece – two of them from DEREE alumni, which are in the final stage of assessment. GSK’s two-and-a-half-year pharma sales and marketing Future Leaders Program offers the chance to develop a range of business skills and a deep understanding of the healthcare environment through challenging placements. The program will include marketing placements with key brands, six months as a sales representative and six months on placement. 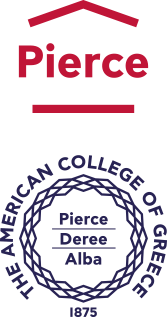 ΤHE AMERICAN COLLEGE OF GREECE (PIERCE – DEREE – ALBA) is a non-profit, non-sectarian educational institution that was founded in 1875. It is the oldest and largest American college in Europe, offering secondary, undergraduate and graduate studies as well as programs in professional education. ACG is accredited by the New England Association of Schools and Colleges (NEASC), the most prestigious accrediting organization in the United States, and has a degree validation agreement with the Open University of the United Kingdom. The College enrolls approximately 4,000 students and has 37,000 alumni who live and work in dozens of countries around the world.